Put on your red shoes and dance the blues…CELEBRATING DAVID BOWIE plays Plaza Live Orlando on March 15, with a brand new Bowie show spanning his entire career. 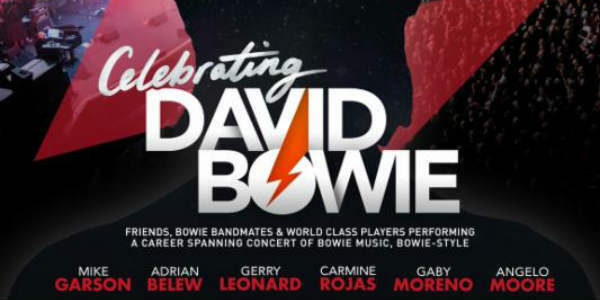 Legendary Bowie touring and recording keyboardist Mike Garson, who collaborated with Bowie for longer than any other player, will be heading up the CdB band for the North American leg, which features guitarist Earl Slick, guitarist and previous Bowie band leader Gerry Leonard (A Reality Tour), and Bowie’s Let’s Dance/Serious Moonlight Tour bassist Carmine Rojas. Between them, they have over 30 years experience of recording, writing and playing live with Bowie. Also along for the CdB tour are vocalist Bernard Fowler, who is known for his work with The Rolling Stones, and 2017 Grammy nominee Gaby Moreno, plus special guests and other former Bowie band members who may make surprise appearances along the way. Confirmed special guests for the Orlando show include Joe Sumner (CdB alum, plus Fiction Plane singer/songwriter and son of Sting), and Mr. Hudson (CdB alum and British singer/songwriter/producer, who has worked with Kanye West, Jay-Z, Duran Duran, Miley Cyrus, and DJ Snake and has toured with Amy Winehouse, The Police and Kanye West). The rotating ensemble with world class multi-instrumentalists changing song to song will perform a show highlighting elements that influenced Bowie and, that in turn, Bowie influenced: pop culture experimentation, art, fashion, science and futurism. For more information on the tour, visit celebratingdavidbowie.com. Tickets start at $29.50 for this all ages show, and can be purchased at the venue box office or online at plazaliveorlando.org.